Features added to the new version of the Delphi Dev. Shell Tools. Full refactoring of the code related to drawing the items bitmaps and icons, now only 32 bpp bmp (Windows 8/7/Vista) and 32-bit with alpha channel icons (Windows XP) are used. Added support for Delphi XE5. Now you can build your Delphi Android projects with a single click without open the Delphi IDE. 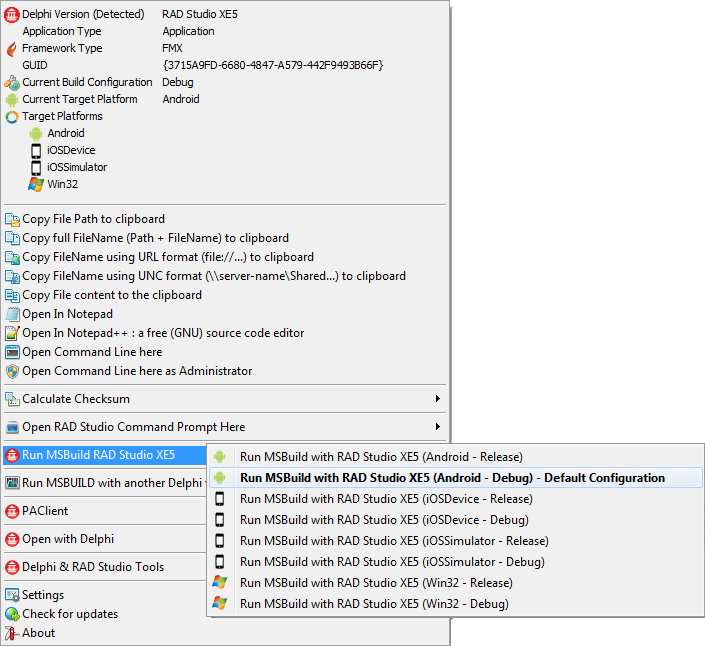 Added feature to extended the Shell extension with custom scripts (.bat). This new option allows create a script and associate a set of extensions. This is a preview of the window to register the scripts. You can setup the Sub-Menu (Group) where the new option will be displayed, the label and image for the menu entry, the extensions associated, set an option to run the script as Administrator and use a small set of macros. The tool includes as set of predefined scripts for FPC and Delphi which you can use as example to register you own most used Apps. h2pas is a small command-line utility that can be used to translate C header files to pascal units. The Free Pascal team uses it to make import units for important C libraries such as GTK or MySQL. ppdep is a small utility that scans a program or unit and creates a depend file that can be used for inclusion by make. It understands conditional symbols and interdependency of units. ptop is a configurable source formatter. It pretty-prints your pascal code, much like indent does for C code. ppudump dumps the contents of a unit in human-readable format. It understands older versions of units and gracefully handles unknown (future) versions. For more info check the Tools that come with Free Pascal page. AuditsCLI.EXE, the Command Line Audits and Metrics Tool, runs the command-line version of Audits or Metrics, depending on whether the --audits or --metrics option is specified in the command line. BRCC32.EXE, the Resource Compiler, is the command-line version of the resource compiler. It accepts a resource script file (.RC) as input and produces a resource object file (.RES) as output. Formatter.EXE, the Command Line Code Formatter, is the command line formatter for Delphi and C/C++ source code files. 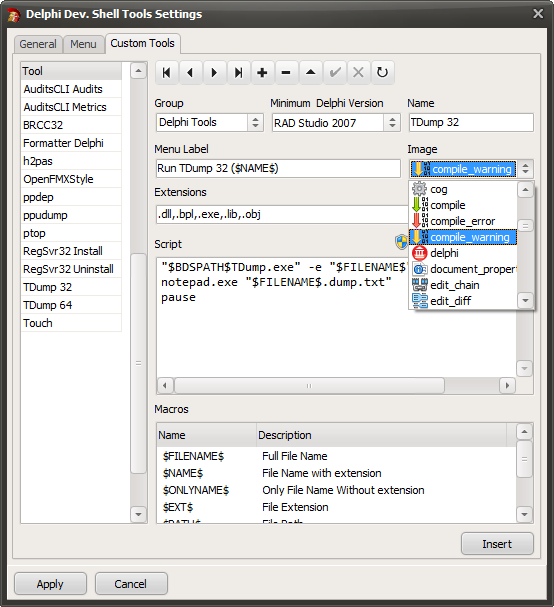 TDUMP.EXE, the File Dumping Utility, produces a file dump that shows the structure of a file. Regsvr32, This command-line tool registers .dll and ocx files as command components in the registry. Categories: Delphi, Delphi XE5, Tools | Permalink.